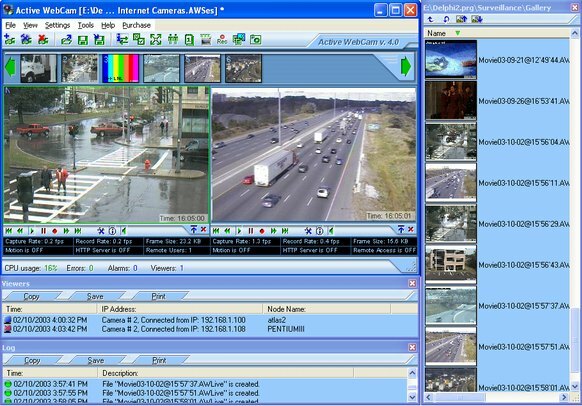 Active WebCam captures images up to 30 frames per second from any video device including USB and analog cameras, TV boards, capture cards, frame grabbers, camcorders, and network IP cameras. The program broadcasts captured content from your computer or uploads it to an FTP server. Broadcasting can be viewed using any Internet browser. The program performs simultaneous recording and broadcasting from unlimited number of cameras. Your camera(s) can be used as part of a surveillance system. When the program detects motion in the monitored area, it sounds an alarm, e-mails you captured images, starts broadcasting, or records video. Live broadcasting as well as recording can be password protected, so all video and audio are scrambled and cannot be watched without a valid password.